There are two major types of connections used in wood buildings: mechanical and joinery (sometimes referred to as carpentry). Within these categories are many variations, and thus a wide range of options to accommodate virtually any building design. Mechanical connections used in wood buildings can be classified into three major categories: dowel, metal connector plates with integral teeth, and shear. There are also a number of proprietary connections that combine characteristics of each of these types. 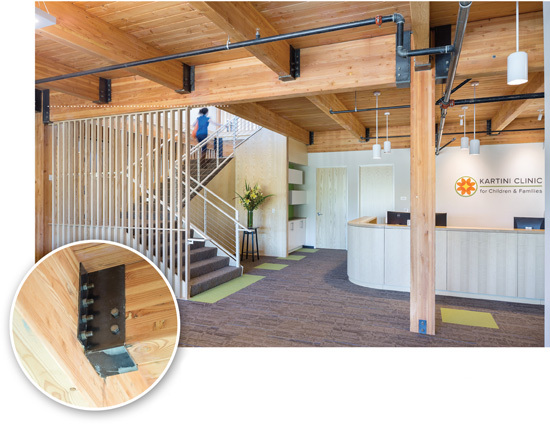 Designed by Path Architecture, Radiator is one of the first five-story timber-frame office buildings to be built in Portland, Ore., since the early 1900s. 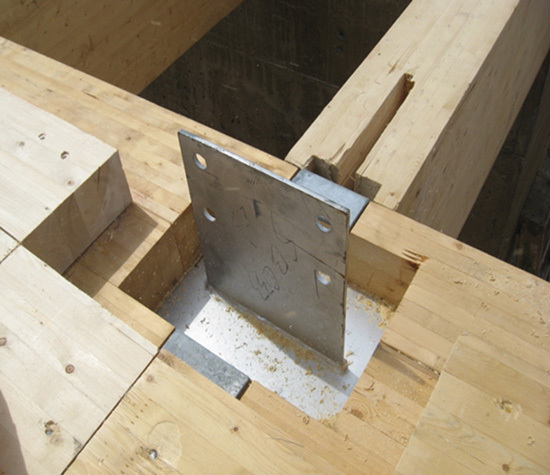 Fabricated steel bucket-style connectors with bolts were utilized for glulam beam-to-beam connections. This chart shows 10 nails, all referred to as 10d, and each with potentially different performance characteristics. Thus, specifying a 10d nail is not clear. Dowel-type fasteners. Wood members connected with dowel-type fasteners are probably the most common mechanical connection type because they are effective at transferring loads while also being relatively simple and efficient to install. They come in many forms and their strength properties can be calculated using the National Design Specification® (NDS) for Wood Construction. Nails are generally used when loads are relatively light, as in multi-family and light commercial buildings. Staples can be used in place of nails, but equivalent capacities need to be determined as the NDS doesn’t publish design values for staples. Screws may be more satisfactory than nails under certain conditions (such as exposure to moisture) since they have less tendency to work loose and generally have high wind withdrawal resistance under severe wind events. Timber rivets are a high-strength dowel-type fastener used in conjunction with specially fabricated metal plates. Dowelled connections transfer the force between members through a combination of dowel bearing and bending of the dowel fastener. Nails come in many types (e.g., box nail, common nail, rink shank, sinker, cooler), as well as multiple pennyweights (the NDS tabulates 6d to 60d). There are also proprietary nails unique to specific manufacturers. Due to the variety of nails available, pennyweight, type, diameter and length should be specified. For flooring, APA – The Engineered Wood Association recommends using a glued-nailed system, as described in the Engineered Wood Construction Guide. In this system, glue is used to attach sheathing to the substrate member, whether lumber or an I-joist, to minimize squeaks and increase stiffness due to T-beam action. All nailing must be completed before glue sets. Gluing is not recommended for bonding wall or roof sheathing to framing because it leads to reduced ductility. Although adhesives may be used in Seismic Design Categories A, B and C, with a reduced R=1.5, their use is prohibited in Seismic Design Categories D, E and F.
Bolt design values are tabulated in the NDS for five diameters (½ in., 5⁄8 in., ¾ in., 7⁄8 in. and 1 in.). Diameters greater than 1 in. are not permitted as they can initiate localized stresses in the wood member, which can cause splitting or other brittle wood failures. Bolts are inserted in pre-drilled holes 1⁄32 in. to 1⁄16 in. larger than the bolt diameter. A common mistake is not leaving enough room for installation of nuts or tightening with a wrench or other torque device. Lag screws are typically used when it isn’t possible to use a nut as required for bolts or when withdrawal capacity is required. They are inserted into pre-drilled holes. The clearance hole for the shank (unthreaded portion of the lag screw) should be the same diameter as the shank, while the lead hole for the threaded portion is a variable percentage of the shank diameter based on the wood’s specific gravity. Because lag screws can be fully threaded, the NDS assumes fairly conservative design values which are based on the smaller “root” diameter of the fastener. Higher lateral capacities for lag screws can be calculated if the designer can ensure the threads are far enough from the shear plane. For more information, see the American Wood Council (AWC) publication, Application of Technical Report 12 for Lag Screw Connections, Design Aid No. 1. Timber rivets are high-strength steel nails typically hot-dipped galvanized, with a flattened oval shank section and a wedge-shaped head. When driven through the pre-drilled steel plate and into the timber, the tapered heads wedge tightly in the holes. Rivets must be driven with the long axis parallel to the wood grain. An excellent way to spread the load with multiple fasteners, they can be used as an alternate to a large number of bolts, resulting in a connection with greater ductility and resilience. Modern Computer Numerically Controlled (CNC) connections provide the ability to fabricate joints with precision. This is especially useful when fabricating joints on large members with complex shapes. Metal connector plates with integral multiple rows of teeth partially penetrate the wood members and are used primarily with fabricated lightweight wood trusses. With these connections, loads are transferred near the surface of the wood member. Shear connectors, sometimes referred to as bearing connectors, are typically used to accommodate heavier loads. They include split rings, shear plates and toothed shear plates. They are usually made from cast iron or light metals, and are capable of transmitting the load relying solely on bearing and shear resistance of the wood in the direction parallel or perpendicular to the grain. They can be used to connect wood to wood members or wood to steel, and may be concealed or visible. Profiled using special machining tools, split rings are usually fitted in a circular groove on the meeting side of the timber members. The split in the steel rings allows the gap in the ring to close or open if the wood members shrink or swell to ensure that the wood members and split ring remain in contact. A bolt is installed through the center to hold the joint assembly together. In connections with shear plates, grooves must be precision machined with special tools, which recess the wood so the shear plates sit flush with the surface. Typically, shear plates and split ring connections have brittle wood failure modes and should be avoided in structures located in high seismic regions unless the designer employs elastic seismic design. The American Wood Council offers a free online connection calculator (www.awc.org), which allows users to calculate capacities for single bolts, nails, lag screws and wood screws per the 2005 NDS. Both lateral (single and double shear) and withdrawal capacities can be determined. Wood-to-wood, wood-to-concrete and wood-to-steel connections are possible. Proprietary connections. Some of the most innovative connection systems are proprietary—that is, produced exclusively by one manufacturer or designed specifically for one building. 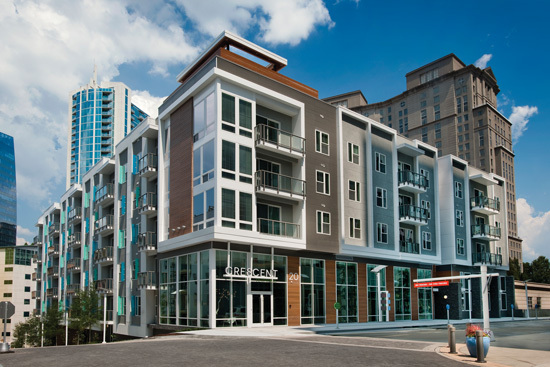 This area has seen considerable growth in recent years, with connection systems and products developed for use in larger and more complex buildings being designed to take advantage of wood’s economic, aesthetic and environmental benefits. Custom-fabricated structural framing connections, for instance, provide a single-piece connection between two framing members. They generally consist of bent or welded steel, carrying load from the supported member (through direct bearing) into the supporting member (by hanger flange bearing, fastener shear or a combination of the two). Pre-engineered metal connectors are commonly used in all types of wood construction. Traditional fasteners like nails, bolts and rivets, as well as generic types of pre-engineered metal connectors such as metal hangers, are reliable and widely used, but have some limitations in large, multi-story buildings that newer proprietary systems are designed to overcome. Newer systems, for example, are often concealed, which makes them fire-resistant if they are sufficiently below the wood surface. They can be designed for use in multiples without reducing the strength of the wood, and they can be designed to be either stiffer or more flexible, depending on the application. 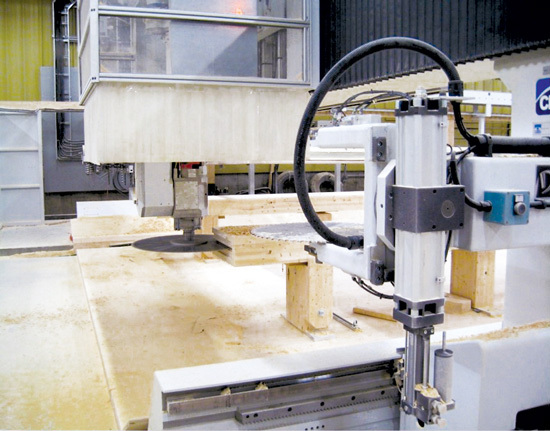 One example of a proprietary product that’s becoming widely used—especially in cross laminated timber (CLT) and glulam structures (see sidebar on page 8)—is the self-tapping or self-drilling screw. A number of manufacturers in North America, Europe and Japan produce them with different features and in many shapes and sizes. They have enhanced hardness for higher lateral load capacity and come in various capacities for different applications. The main advantage is that they can be driven into wood without pilot holes, using a regular handheld power drill. This lessens the risk of mistakes in the field and improves efficiency and reliability. Pre-engineered connectors are manufactured by component manufacturers, which have exhaustive catalogues of products that suit various applications. Categories, in addition to the ones previously mentioned, include framing anchors, hold-down devices, straps and ties. Many components are fabricated using formed sheet metal, increasing in thickness as loads increase. Specific nailing and fastening requirements are provided by the manufacturers and must be rigorously followed to develop full connection capacity. Reference design values for mechanical connections are provided in various sources. The NDS contains reference design values for dowel-type connections such as nails, bolts, lag screws, wood screws, split rings, shear plates, drift bolts, drift pins and timber rivets. Design values for proprietary connectors are provided in code evaluation reports. Traditional joinery connections (also known as carpentry connections) are typically created by cutting notches, holes and tongues in connected members so they interlock—such as with mortice/tenon and scarf joints. In these types of connections, forces are in principle transferred in compression/bearing. Interlocked connections in tension require wood or metal pins or keys to prevent separation. Tension connections are often kept to a minimum, and in some cases metal straps and bolts are provided to achieve better connections, mainly for long-span roof trusses in historic structures. In a properly designed joinery connection, there is sufficient interlocking, tightening of connections and friction due to the self-weight and supplementary support from walls, buttresses and adjacent buildings to design for both gravity and lateral forces associated with wind or seismic events. While fairly common in single-story homes, commercial and recreational structures, joinery connections are seldom used for modern, multi-story heavy timber buildings. One reason is the fact that these connection systems demand highly developed skills usually associated only with experienced carpenters. Such connections are also labor intensive which makes them uneconomical for industrial production. Although joinery parts can be produced with great speed and precision using Computer Numeric Controlled (CNC) technology, this approach is not as widely used in North America as it is in Japan and Western Europe. Here, mechanical connections dominate primarily because they can be made without expensive equipment and assembled with relative ease on site. One of the benefits of joinery-type connections is that they’re often made entirely of wood. If the connection is exposed to moisture and drying, the change in dimensions of the wood parts will be similar. In a wood/steel connection subject to the same moisture/drying, there may be a differential change between the wood and steel. At the Jackson Hole Airport in Jackson, Wyo., embedded steel knife plates with structural screws provide load transfer at brace-to-beam connections. Although notching is an essential technique in traditional joinery, and may be required in the field for a number of reasons, any field notches or holes that are not properly made, or that deviate from approved drawings, may significantly reduce the capacity of even a properly designed member. The NDS provides guidance on notching, and the wood industry has produced extensive technical notes with recommendations related to the size of notches appropriate for different materials. 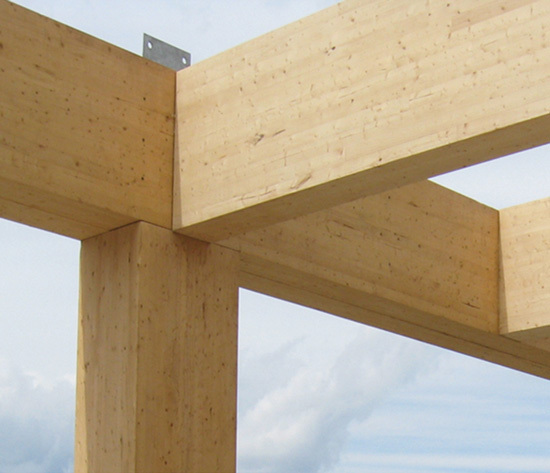 With glulam, for example, end notching is limited to 1⁄10 the depth of the member or 3 in., whichever is less. When a notch is used, designers should consider driving a lag screw or self-tapping screw in 6–8 in. from the bearing going up past the neutral axis. If a crack were to develop, the screw will keep it from progressing down the length of the beam and acts as a transverse reinforcement. Beam-to-column connections: Continuous full-depth side plates can cause problems because they restrain wood shrinkage and may cause splitting. Solution: Smaller discontinuous side plates transmit forces and allow wood movement. 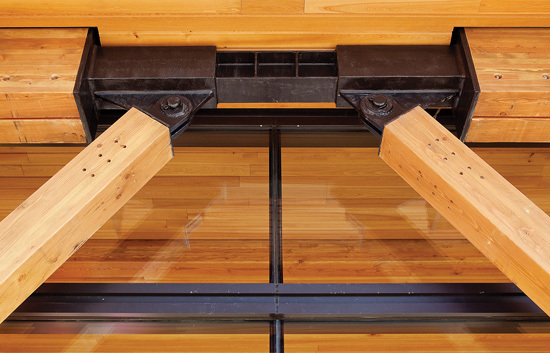 Beam-to-beam connections: For beam hangers, fasteners placed near the top of the supported beam can restrain wood shrinkage and may cause splitting. Solution: Fasteners placed near the bottom of the supported beam can minimize the effects of shrinkage while top tabs provide lateral restraint. Another issue related to moisture is exposed end grain. This can result in checking and possible decay, even in low-rainfall climates. Solutions: Redirect water flow around the connection. Use preservative-treated or natural decay-resistant wood products. (If preservative-treated wood is used, preservative treatment needs to be applied after all field cuts.) Use end caps and flashing. Allow for air flow and drying—e.g., by detailing drain holes or slots in box-type connectors or maintaining a gap of at least ½ in. between wood and concrete or masonry construction.